The Honor Society for Leap Year Babies is a free honor society devoted to anyone born on this rare day. Chances are 1 in 1,461 that you are one of them. I don’t know if there are any official Christmas Honor Societies for babies born on December 25; except, of course, it’s a more distinct honor to share one’s day with the birth of Christ. There are quite a few websites devoted to complaining that being born on Christmas Day means being eclipsed by the holiday celebration. The biggest complaint by these whiny ones is that they receive a reduced number of presents. In their defense, probably all of us have a forgotten December relative. My niece, Katie, is born on a day close to Christmas, and I admit to conversations with my sister about the proper gift protocol. It is easy to forget her day in the holiday rush. In the imaginary Honor Society for Christmas babies, quite a few famous people can boast being members, including Sir Isaac Newton (1642) and Red Cross founder Clara Barton (1821). Robert Ripley, of Ripley’s Believe it or Not fame was born in 1893. Twentieth Century Christmas stars are band leader Cab Calloway (1907), Egyptian president Anwar Sadat (1918), singers Jimmy Buffet (1946) and Barbara Mandrell (1949) and acress Sissy Spacek (1949). A more complete list is on christmasbirthday.net. I like the story of actor Humphrey Bogart’s birthday. Born on December 25, 1899, he was often referred to as “The Last Century Man” (based on the popular belief that the 19th Century ended in 1899, not 1900 as it really was). 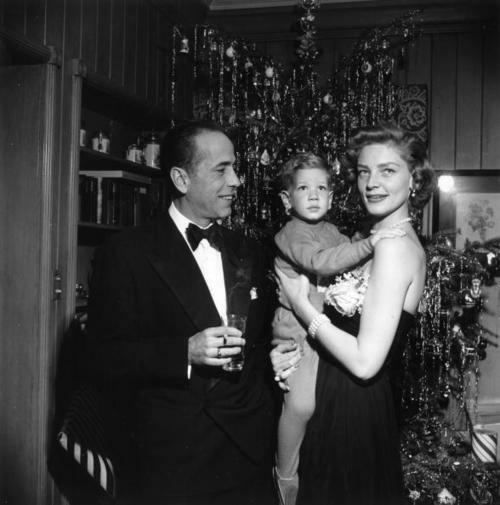 The New York Times reported in 2000 that Bogart was really born on January 23, and his birthday was changed to December 25 because it was more glamorous. According to Encyclopedia Britannica and other sources, this was a false report: Bogart’s birth certificate does say December 25. 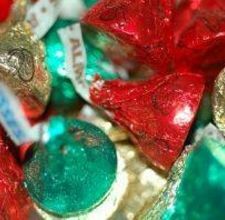 What do the FAFSA and Aluminum Trees have in common? I completed the FAFSA tonight after some small hassles. I’d like to say there’s something connected to Christmas and the FAFSA, but I can’t think of anything, except that there’s a lot of money involved in both. Back in the 1960’s, I don’t know if people completed the FAFSA. I do know, however, that I probably couldn’t have afforded my very own Evergleam Aluminum Christmas Tree, retailing for $25.00. 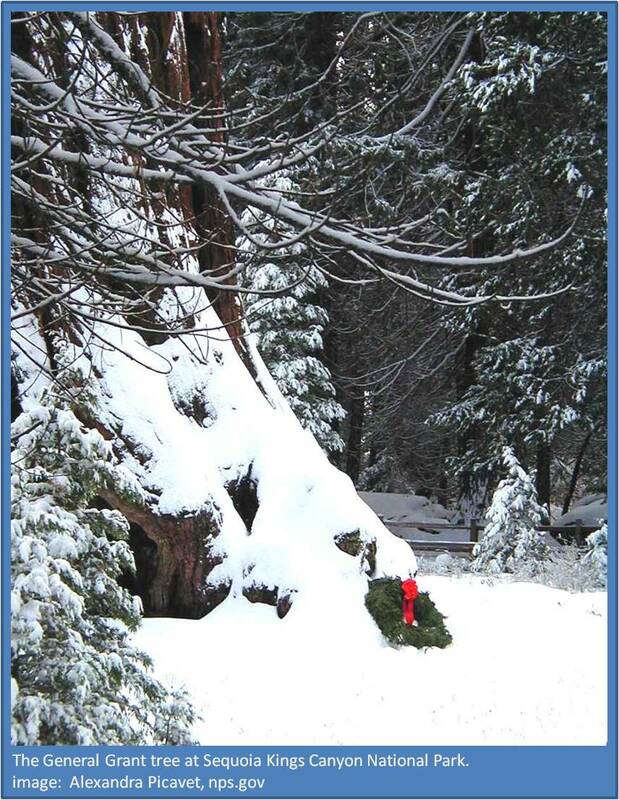 I used an inflation calculator provided by the Consumer Price Index to determine that the same tree would have cost $180.00 in today’s dollars. The Aluminum Specialty Company, the early manufacturers of the trees, was bought and consolidated a few times and does not exist any longer. If I talk Roger into the purchase, though, I can always go to several vintage websites or eBay. Looks like I’ll have to fork over about $300 – $500. Mmmm. Sounds a little like the way that college costs have increased over time. Can’t afford that, either. I’ll have to settle for liking the Evergleam tree on Facebook. (Apparently, there are 79 of us crazies out there). For a real thrill, I can see countless videos of the Evergleam tree on YouTube. My favorite, a short film with a Frank Sinatra soundtrack, is linked here. I want a pink Christmas! I volunteered at the American Red Cross fundraiser, Project: Prom Dress, today at the Dancel Family Y in Ellicott City. Situated at the check-out table, I had a great view of the dresses as they made their way back and forth between the boutique area (in the gym) and the dressing room (in the exercise room) to the check-out rack. The dresses were donated, and most were very modern, but I admit to a secret admiration for not-very-trendy pink dresses. One dress (both candy pink and polka dotted) went out late in the day with a young lady who looked far too young to be attending a prom. She explained that the pink dress was going to be a costume in her middle school play because she needed to be dressed in a tacky 80’s style prom dress. Ugh. Yes, my senior high prom gown, lovingly created by my mother (at my request), featured pink, pink, pink with a darker pink lace overskirt. 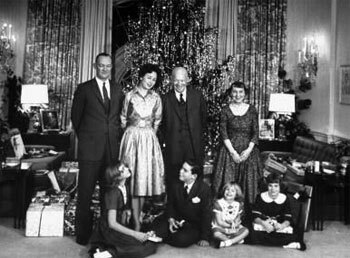 Only tangentially related, to round out our Presidential Christmas posts, I’d like to highlight Mamie Eisenhower’s trendsetting use of pink in the White House, and, actually, in all of her homes. As the wife of a military officer, she had the opportunity to decorate many homes (over 30 moves during his 37-year military career) and is reported to have carried samples of the pink, green and cream colors that she used in her decorating. In that way, the painters could match the paint to her belongings. From 1953 – 1961, the Eisenhower White House was called the “Pink Palace.” Although there is no record of pink Christmas trees, there is a sure connection to the skyrocketing rise in pink decorating in the late 1950’s. There are scores of retro websites devoted to the love of pink bathrooms, a decorating fever that started with Mamie’s personal style. 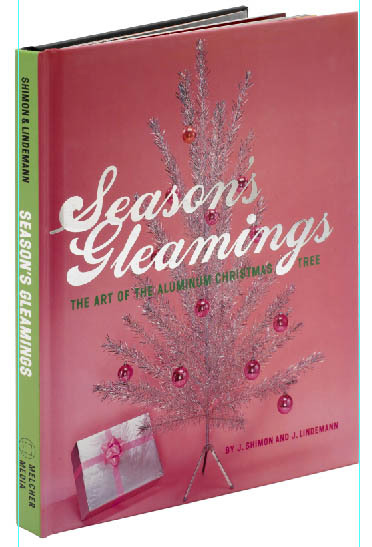 This time period is also the advent of the aluminum Christmas tree, with Sears and other department stores featuring the aluminum tree in a number of colors, including silver, orange, and pink. Although our family didn’t have an aluminum tree, the old photographs of children standing next to aluminum trees in the 1960’s look suspiciously like a childhood me. 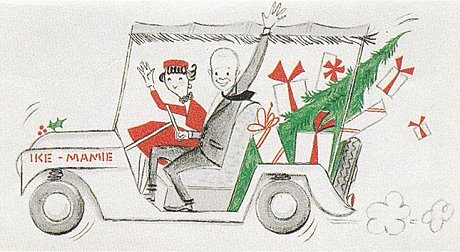 In A Charlie Brown Christmas (1963), Lucy tells Charlie to get an aluminum tree, perhaps painted pink. The segment of the film featuring the garish aluminum trees is one of my favorites. 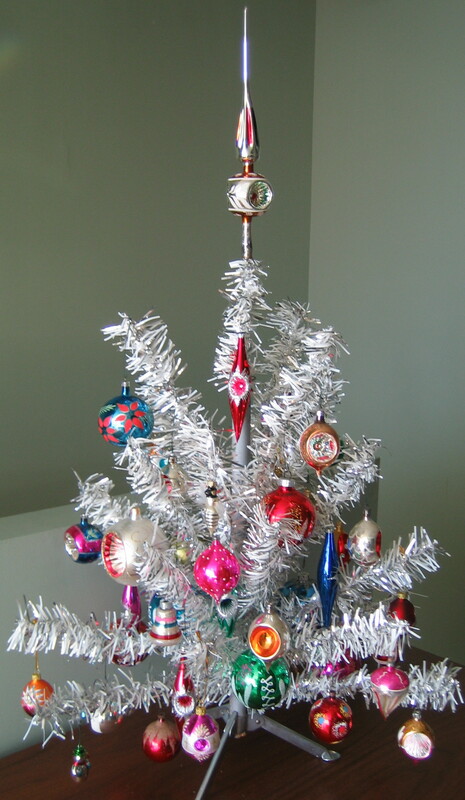 The ridicule of the aluminum tree and the commercialization of Christmas in that film considered one indicator that aluminum trees were on their way out of style, but they continued to be manufactured into the 1970’s. In January we warned you that on the 25th of each month we would be revealing one of our secrets for the perfect Christmas in 2012. 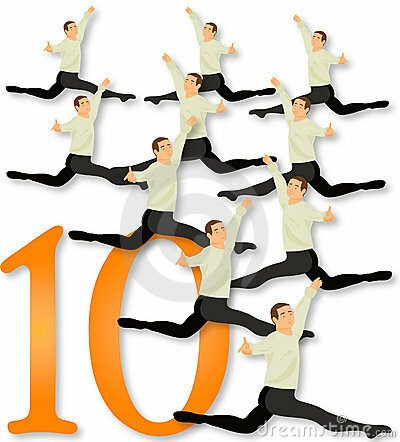 Today we reveal Secret #10- Simple Can Be Better. This can have many meanings for the holidays. Simpler schedule, simpler gifts, simpler times. It is so easy to get caught up in the complexities of the season. Go here, go there. Do this, do that. Buy this, get that. Remember that Christmas began with the a quiet and simple birth of a child in a manger. No elaborate spectacles, no budget busting shopping sprees, just a family welcoming the new-born baby. The simple joys of the holidays are often the most precious. Think of your favorite holiday memory. I bet it’s a special moment or kindness shared with family or close friends. One of my best memories of recent Christmas years is the late evening Christmas Eves spent with my mother. She would be finishing some special baking treats and I might be wrapping some final stocking stuffers. The fire was burning warm and bright and we were definitely watching the broadcast of the Pope’s midnight mass. I see these shared times as truly simple gifts. Then we’ll all live together and we’ll all learn to say. 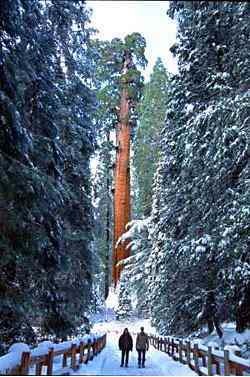 While First Lady Grace Coolidge sponsored the first National Christmas Tree in 1923, in 1926, President Coolidge dedicated a large Sequoia in the Sequoia & Kings Canyon National Park as the Nation’s Christmas Tree. 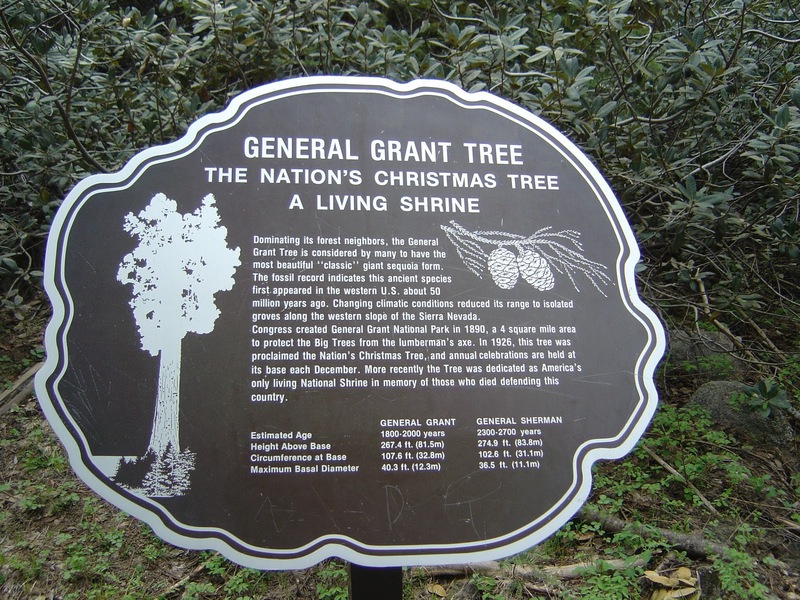 This tree, the General Grant Tree, in the small Grant Grove, continues to stand and is the second largest tree in the world and the only living national shrine to war dead, as declared by President Eisenhower in 1956. In October 1949, nearby Sanger was dedicated by the Post Office Department as the Nation’s Christmas Tree City. The Chamber of Commerce sponsors the annual “Trek to the Tree,” always held on the second Saturday of December. Members of the Park Service lay a large wreath at the foot of the massive tree. branch is 130 feet above the ground, and the circumference of its trunk is 107 feet. Oh, and if I do get to go to California, who wants to watch the dogs that weekend? From 1953 to 1961 the White House was home to President Eisenhower and his family. This was a relatively happy and peaceful time in the US. World War II and the conflict in Korea had ended, the unrest of Vietnam and Civil Rights were not yet upon us. It was a time of prosperity. The Eisenhower White House reflected this, especially at Christmas. It was common practice for the President to host two parties at the holidays. One for the political staff in the West Wing and another for the household staff of the White House. Race practices of the time played a part in the separation. The Eisenhowers were the first to hold a single party. Mrs. Eisenhower supervised the plans the included over 500 guests! Mamie was a Christmas devotee and wanted the day to be special for all. She personally shopped at Washington department stores to purchase gifts and then hand wrapped them herself. This was also to save money. Mrs. Eisenhower took decorating to an all time high for the residence. She had a record (at the time) 27 decorated trees. Holiday music was played in every room and all the columns on the house were wrapped in greens. The Love of Christmas was not for Mamie alone. President Eisenhower also enjoyed the holiday. Ike was an avid artist and enjoyed creating Christmas cards and prints to be used by the White House. In the eight years they lived there, the Eisenhowers used 38 different artist images for cards and gifts- a record number for any time. The Eisenhower cards serve as a great piece of memorabilia from the time. The connection between the Eisenhowers and Christmas continues today. The Eisenhower National Historic site located in Gettysburg, PA hosts the annual event “An Eisenhower Christmas”. The National Park Service hosts this annual event each December. Visitors to the home see the house decorated as it would have been during the presidential years in the 50s. The house is open to the public (entrance fees in 2011 were $7.50) and there are regional bus tours organized to visit the home. It was even listed on the Frederick calendar of holiday events this past Christmas. I will definitely be checking it out this December!